Open access promotes broader access to academic research by scholars, students, professionals and the general public. The concept of open access continues to evolve, but in general, it means that works such as peer-reviewed journal articles, graduate theses, data, or other types of scholarly information are made available free of charge, immediately (no publisher delay or embargo), and in a permanently accessible, online format. 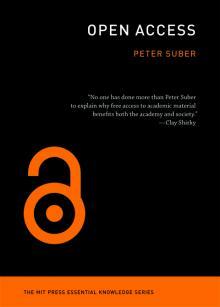 A brief overview of the development of the open access movement, written by Peter Suber, currently a Fellow of the Berkman Center for Internet & Society at Harvard University. Open Access Tracking Project (OATP) uses social tagging to capture new OA developments comprehensively and in real time. News and commentary about open access from a biomedical perspective by Charles J. Greenberg, Yale University. Although no longer maintained, this site serves as an archive of open access news and issues from 2002 to 2010.